On 4th August 2011The Provincial Grand Master of Stirlingshire, Brother Andrew A. McKinnon, presented a cheque for £4,500.00 to Mr. James Brown, fund-raiser, from Strathcarron Hospice. The money was raised by the Brethren of the Province of Stirlingshire in association with the annual Charity Golf Competition staged at Ross Priory Golf Course, Gartocharn in May this year. 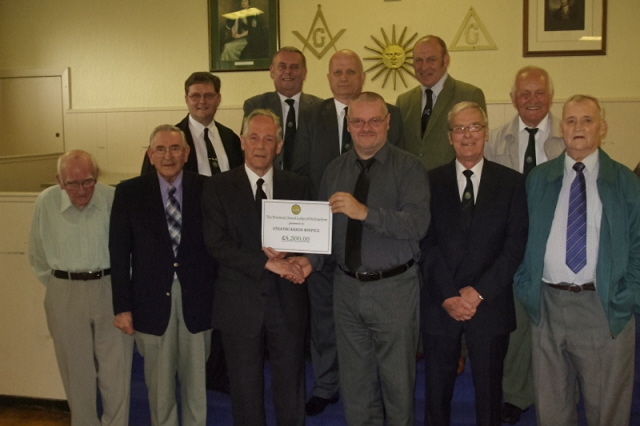 The photograph below show presentation being made at Lodge St. Andrew (Denny & Loanhead) No. 176 in the presence of a number of Office-bearers of the Province of Stirlingshire.